Amanda has a long-term plan. All dripping sauce all over the floor. That’s what happens when you do something yucky,Selkie. XD Oh well. At least she learned. Amanda, if Selkie gets banned from all the things she *can* eat, she won’t be able to eat anything, which is unfair as all getout. That’s a cruel hope, kidlet. And, like a typical kid, Amanda acts impulsively instead of thinking things through. It’s also rather selfish of Selkie to want to hog all the meatballs and chicken wings for herself. Considering she can’t eat the cookies or cake, seems only fair to me that she have something that she can have to herself. Were I hosting a party with a guest with special dietary needs, I’d make them something just for them that they can share if they choose, but is for them specifically. I think it’s the shape. Rainbow streaks work better than rainbow bullseye. It’s a bit harsh, but in fairness, she DOES need to learn sanitation more urgently than the average person since we know she’s poisonous. Though on the other hand we probably can’t catch each others’ diseases. I’m kind of hoping Mari means the embargo is “for now.” Seems ridiculously harsh considering it’s okay to eat cookies when your hands, and Selkie’s selections of treats is a lot more limited among humans than Sarnothi. Besides, unless Selkie was fondling other meatballs than the one she picked out it’s highly doubtful she spread any germs. Her only mistake is grabbing them before Mari said they were safe to eat and getting burned is a punishment in itself. Its not harsh at all. Cookies are a finger food to began with, with one easily taking a single cookie without touching the others. A pot of meatballs are usually packed together, with sauce, is quite different. There was something stopping Selkie from using a spoon to get herself some, but she simply chose not too. Are they covered in sauce? I’ve seen meatballs that aren’t that could easily be finger food. I am really confused by this story. It seems they would mess with Selkie’s allergies/aversions. Same with the breading on what appears to be fried wings on the next page. I am assuming Mari will hang onto them for “dessert.” It is, however, odd to stick a treat in front of a youngish child (8 is on the tailend) and tell them they can’t grab any. She said it with a smile shortly after. I take it the embargo is until she can get Selkie her own, which is a fine solution. I don’t think the embargo is an actual banning. How low is Selkie’s body temperature? We know she’s sensitive to cold, but if she’s straight up ectothermic then chances are really good she harbors salmonella. Pretty much all amphibians and reptiles are covered in it, but it’s not that big a risk except to the super young and super old..
No they aren’t. You might get it from their poop (which they can step/slither in)–and that is just reptiles by the way–not amphibians. We actually had a toad die from a salmonella infection at the zoo because one of the other volunteers neglected to wash their hands between cleaning animal cages and handling. However, it isn’t common for reptiles to carry salmonella. You are more likely to get infected by undercooked poultry than a pet snake–especially if you practice good husbandry. 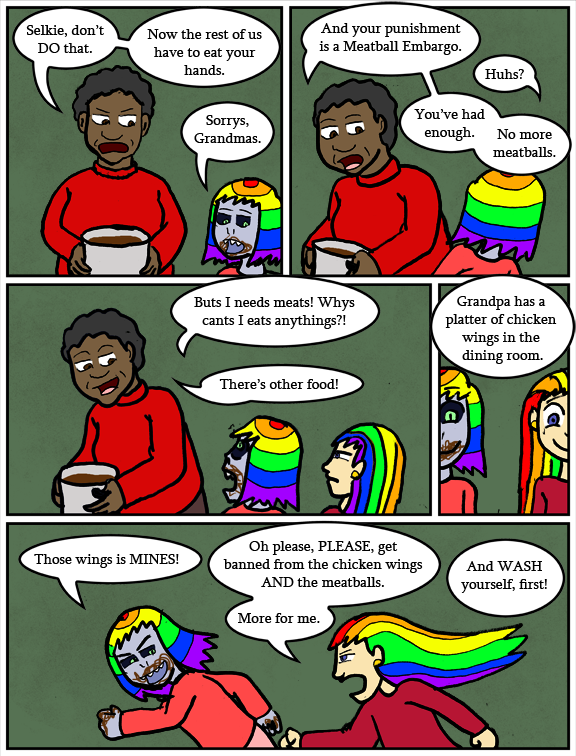 *sigh* i foresee amanda trying to stuff as a many wings as possible before selkie is back from washing up – she´d do anything to get one over her. and its starting to get really annoying…. And then Amanda gets an embargo. Sorry, no idea why it posted the same comment twice. I wonder if those chicken wings are plain or did someone coat them with yucky veggies such as hot sauce? I have to say Selkie should have known better. That stuff with the hands is something a toddler does.